Little is known about American architect Christian Francis Rosborg other than a few projects and drawings attributed to his name that rest in Cooper Hewitt’s collection. Trained early on under the mentorship of New York-based architects Ernest Flagg and Haydel & Shepard, the obscure figure was part of the early twentieth-century stylistic transition from French-influenced Neo-classicism to the Art Moderne or International Modernism movement. 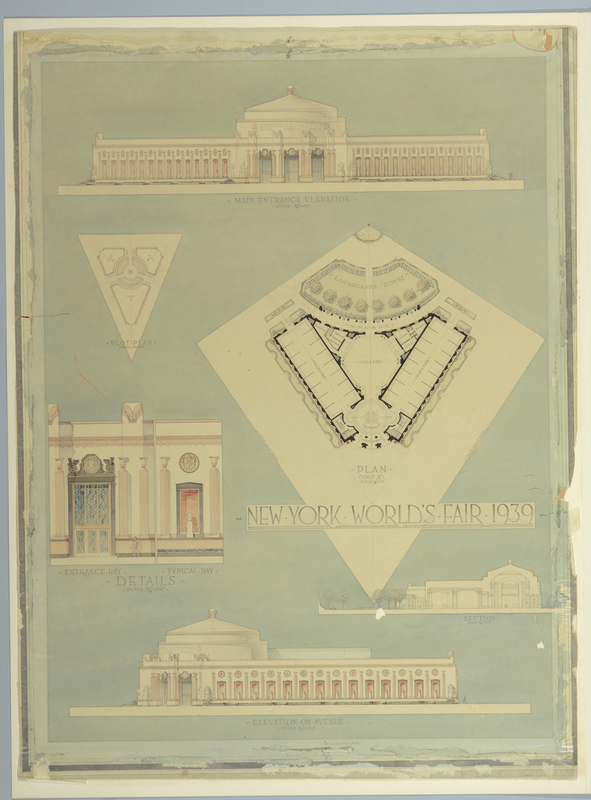 His design for the John David Commercial Building in New York (1940), for which Cooper Hewitt holds a drawing, reveals his penchant for Modernist lines, but, as this prospective design for the 1939 World’s Fair suggests, in his later years, he still found comfort in classical motifs honed under the tutelage of École des Beaux Arts-trained Flagg. The question of whether the design or an adaption was ever conceived looms over this drawing. Fair maps and photographs offer scant evidence. The building or one that might have taken its place does not appear in a comprehensive guide of each pavilion at the fair. The style of Rosborg’s design also clashes with the strong prominence of high-modernist pavilions and the “world of tomorrow” theme. While the triangular and curvilinear layout of the proposed pavilion’s site plan are modernist in form, the Neoclassical facade harkens back to the Beaux Arts style. Could this design have bridged the sharp transition between both movements? Rosborg would have been one of many ‘recruited’ into his teacher’s mandate to establish an American style that preserved the Neoclassical principles taught at the Paris-based École des Beaux Arts. Starting in the 1890s, a slew of influential New York-based practitioners made their way to study at the famed school, including the likes of Ely Jacques Kahn and Whitney Warren. Thus, Beaux Arts Neoclassicism became the dominant style during New York’s 1910 – 1930 building boom. While many contemporaries had whole-heartily adopted the new International Modern style by 1939, Rosborg seems to have mediated the conversion gradually. Adrian Madlener is an MA Fellow in the Drawings, Prints & Graphic Design Department at Cooper Hewitt, Smithsonian Design Museum. He is enrolled in the History of Design and Curatorial Studies program at Parsons/ Cooper Hewitt. Deborah Nevins, “Christian Francis Rosborg,” in Gebhard and Nevins, 200 Years of American Architectural Drawing, 220. The Exhibition Souvenir Corp. Views of the World’s Fair. New York, 1939. Mardges Bacon, “The French School Comes to America,” in Ernest Flagg: Beaux-arts Architect and Urban Reformer (New York, NY: Architectural History Foundation, 1986), 50.